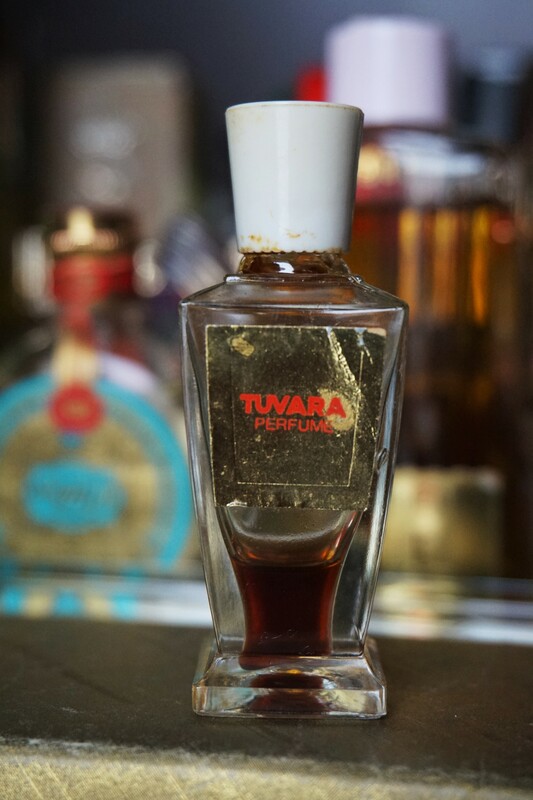 Balsamic, spicy and a tiny bit green (to my nose), Tuvara (Tuvaché 1948) is a warm, exotic vintage beauty. The incense, patchouli, aldehydes and chamomile seem strongest at first. Eventually, sandalwood, myrrh, vetiver, musk and oakmoss reign supreme. Tuvara reminds me of the other fragrance by Tuvaché I own, Sumatra. While Sumatra is a bit less sandalwood sweet, just to name one difference, they are both dense, smooth and complex. They are both quite captivating. I feel fortunate to have both in my fragrance wardrobe and perhaps will keep my eyes open for other Tuvaché scents..
Top notes: chamomile, bergamot, lavender and aldehydes. Middle notes: ylang-ylang, geranium, jasmine, patchouli and incense. Base notes: sandalwood, myrrh, vetiver, labdanum, oakmoss, musk, patchouli and vanilla. Last night my son decided to have his own personal party at 2:00 am. Mom and dad were invited… We attended. It wasn’t a bad party. There were lots of finger foods… toddlers are big fans of that I guess. And at the end of it all, we drove him around and he fell asleep listening to good music in our car. He’s a great little guy. I just wish he liked sleep more… Ha! But I’ve finally started losing my baby weight. 😉 Haha. I have about five to ten lbs. to go, although we’ll see. I almost don’t want to be quite as skinny as I was before again. Oh, and my son seems to be reading. Yup. Reading. He’s two. He’ll sometime point to phrases or words written somewhere and say them. I’m bragging. I’m sorry (not entirely). Ha! Maybe that’s why he hates sleep. He has exciting things to discover.